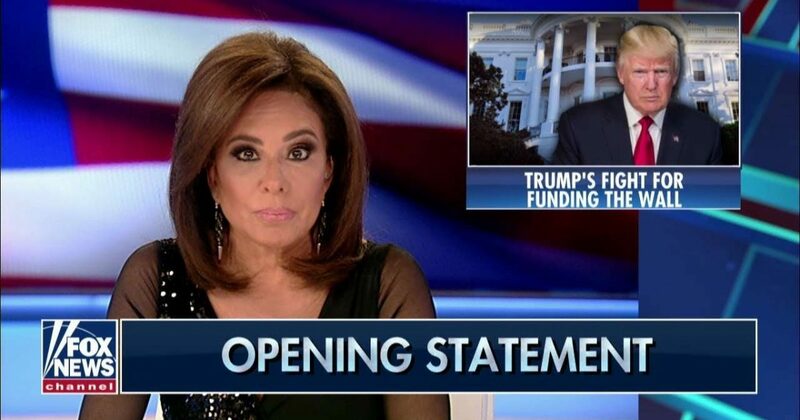 Judge Jeanine may be President Trump’s most ardent supporter, and she is certainly in favor of building the border wall, which may seem like a no-brainer to those of us with at least two active brain cells, but you might be shocked to discover how many numbskulls in America cannot be included in that group and actually disparage President Trump and anyone else who favor border security to keep gangs, drugs, and welfare parasites out of our country. Following is a partial transcript of Judge Jeanine’s open, followed by the video and several other videos of prominent Republicans explaining the situation and likewise encouraging President Trump to stay the course and don’t give up until the money for the wall is there. He didn't say when or how. Be patient. No, that's not enough. The Democrats need more illegal voters. They are running some pretty tight races. More illegal voters means more Democrats in office. They will never agree to shut down the border to prevent Democrat voters from illegally sneaking in.